This article is about the crocodilian enemy first featured in the game Donkey Kong Jr.. For the piranha-like enemy of the same name, see Snapjaw (Donkey Kong Country 2: Diddy's Kong Quest). For the crocodilian enemy that appeared in the game Yoshi's Island DS, see Snap Jaw (Yoshi's Island DS). A Snapjaw as seen in artwork for Donkey Kong Jr.
Snapjaws (also spelled Snap Jaws) are enemies which resemble small alligators, with early appearances also resembling bear traps. They attack with gnashing teeth and are able to travel along vines. 1.3.3 Mario vs. Donkey Kong: Minis March Again! Snapjaws as they appear in Arcade (blue & red), NES and Atari 2600 versions of Donkey Kong Jr.
Snapjaws first appear in the game Donkey Kong Jr. Here, they are used by Mario in an attempt to defeat Donkey Kong Jr. Like the ape, Snapjaws can climb vines. Whereas blue Snapjaws simply fall off a vine when they reach the end of it, the red variety thrown by Mario can continually climb up and down vines and move on platforms. Snapjaws can only be defeated by dropping fruit on top of them. In Donkey Kong for the Game Boy, Snapjaws appear in Stage 2-4 in the Forest and three stages of the Jungle. They act much as they do in their previous appearance, and Snapjaws thrown by Donkey Kong act like the blue ones of Donkey Kong Jr.; however, as color is not used to differentiate between enemy types, these Snapjaws have spiked bodies and shorter snouts. Snapjaws can be defeated with fruit or a hammer. Snapjaws in Captain N: The Game Master. Snapjaws appear in the episode titled "Queen of the Apes" of Captain N: The Game Master. 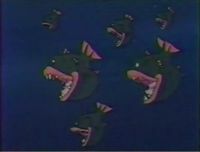 Like many entities in the series, they are very off-model, being depicted as fish with large underbites (incidentally similar to the creature of the same name from Donkey Kong Country 2: Diddy's Kong Quest). A Snapjaw in Mario vs. Donkey Kong. The next appearance of Snapjaws is in Mario vs. Donkey Kong. They show up in Donkey Kong Jungle, and have spikes instead of chains. The ones that appear in the fifth stage have a red and green coloration, whereas Donkey Kong tosses Snapjaws with a blue and purple palette in the DK stage. These Snapjaws do not fall off their vine; rather, they will climb up a vine approximately twice, at which point they will vanish. Like in the Game Boy Donkey Kong, Snapjaws can be defeated with fruit or a hammer. Snapjaws reappear in the Mario vs. Donkey Kong 2: March of the Minis floor Jungle Hijinks, having a slightly updated appearance. They rapidly patrol vines, and if a Mini Mario touches one, the Mini Mario will be defeated. They do not fall off vines, and fruit can once again defeat them. Snapjaws reappear in Mario vs. Donkey Kong: Minis March Again! in similar capacity. They are found in Jungle Rumble, in which they serve as shields for Donkey Kong. Mario with a Snapjaw in Donkey Kong Jr. The original appearance of Snapjaws, that of a fanged monster with a chain dragging behind it, is similar to the appearance of another creature encountered later in the Mario series, the Chain Chomp. Klaptraps, small alligators introduced in Donkey Kong Country, may be based off Snapjaws. A Snapjaw makes a cameo appearance in the Game Boy Camera accessory for the Game Boy handheld system, as the SHOW option's cursor. ↑ Donkey Kong Jr. NES instruction booklet, page 5. 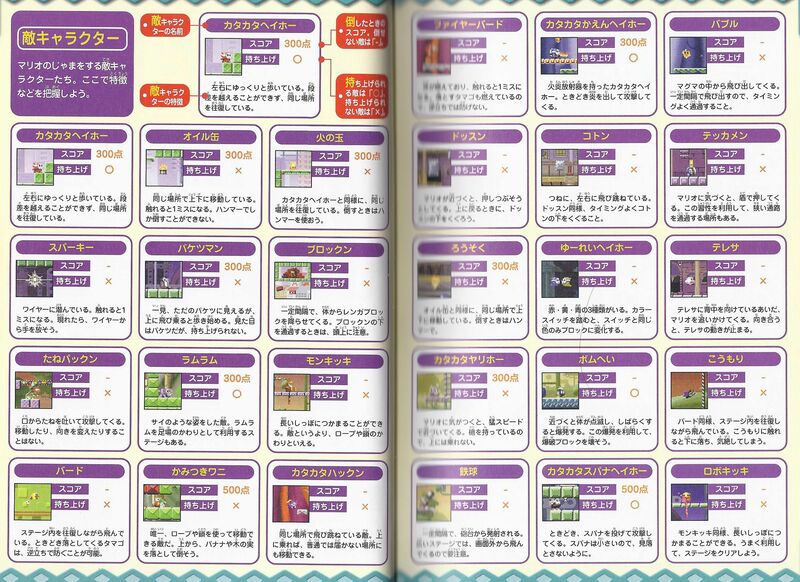 ↑ Perfect Ban Mario Character Daijiten, page 95. This page was last edited on January 31, 2019, at 20:40.